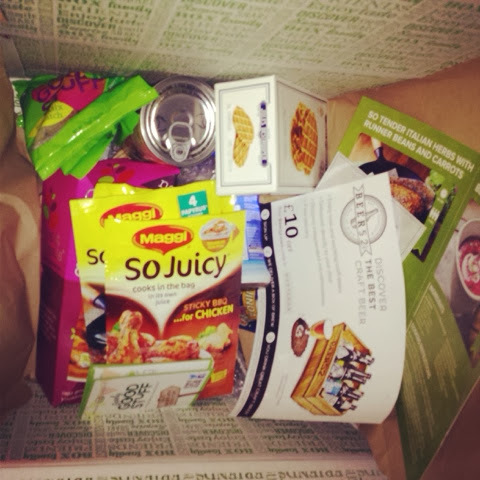 I LOVE my food and I love the idea of subscription boxes so imagine my delight when I was approached to review Degustabox. Degustabox is a monthly subscription box filled with delicious food products at only £12.99 per month. The best part is that there is no commitment necessary. I was so excited as soon as I opened my box and Chris was already wanting to dive in. I had to shout, "No, I need to take photographs!!" Bless him. I must warn you, this is a photo heavy post! This drink is made from 85% coconut water (from concentrate) and a more-ish natural chocolate flavour. It is an excellent low calorie option with great hydrating qualities. I only took one sip of the coconut water and decided that it wasn't for me. I'm not a big fan of water, even my diluted juice has to be really concentrated. For me, there just wasn't enough of a chocolate flavour for my liking. Chris really enjoyed it though! This granola contains a heavenly mix of traditionally baked oats and zingy blackberries and raspberries. This is absolutely delicious and is a great way to start the day. I've only had a few bowls and Chris keeps stealing it all! Jules Destrooper are a family company that have been baking biscuits for 125 years. Their Butter Crisp biscuits are made using rich summer butter and a secret blend of spices. These go down great with a cup of tea and I must admit, they didn't last very long in our house! They have a gorgeous buttery flavour and were bigger than I expected them to be! This soup is made with organic ingredients and they put the same care and attention into it as home cooked food. It can be found in the free from section of supermarkets. I'd never tried chunky tomato soup before, I'd usually stick to Heinz but this a welcome change. It really filled me with a roll and lunch and I will be purchasing more of Amy's Kitchen soups with my grocery shop. I don't eat soup very often but it has reminded me of how much I enjoy it! This item was included in the Degustabox in celebration of Chinese New Year. This tea faithfully adheres to the ancient Chinese recipe. It is filled with pro-biotic enzymes, antioxidants, vitamins and minerals. We received these in So Juicy Sticky BBQ Chicken, So Tender Italian Herbs Chicken and So Juicy Mexican Chicken. We have bought all these varieties in the past as they are a quick and easy solution for a tasty midweek meal. I was really pleased to see these included as we love them. They're so easy to use and they have a 3 step guide on the sachet. These are the perfect way to enjoy quinoa and save time. Quinoa is a superfood which is high in nutrients and it's gluten free. We used ours cold in a salad but it can be eaten heated as part of a side. They are organic and fairtrade and have won 4 Great Taste awards. This isn't something that I've tried in the past, and to be honest, I probably wouldn't have tried if it weren't for this box, but it is definitely something that I'll pick up in the future. 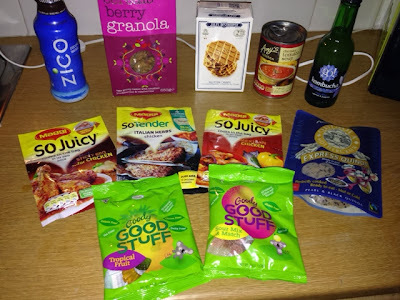 Goody Good Stuff sweets are suitable for vegetarian, Halal and Kosher diets and they use high quality ingredients to produce a range of confectionery that are gluten, dairy, soy, nut and high fructose corn syrup free. We received a bag of Tropical Fruit and Sour Mix & Match. These were the first items that we opened, naturally, and I think they were all scoffed in around 3 minutes? They taste no different to non vegetarian sweets. My best friend is on a gluten free diet so I will definitely be picking some of these up for her! Degustabox have been very kind to offer one of their boxes up as a competition prize! You just need to fill in the Rafflecopter widget below. This competition is open to mainland UK residents only, over 18 and will end on 18th February. Good luck! 148 comments on "Degustabox: January - Review & Giveaway"
Maggi So Juicy - never tried these before. The butter crisps sound yum! Ooh I'd love to try the sweeties, they sound delicious! Quinola Express - sounds great! I'D GO FOR THE QUINOA AS I LOVE IT BUT IT'S V EXPENSIVE TO BUY NORMALLY. The Goody Good Stuff sweets sound great - no gelatine! The coconut water sounds yummy! I'd love to try the Maggi sachets, yummy!! The granola - I need some new breakfast ideas! The Maggi sachets - they really appeal to me! Love the sound of the butter crisps! I'd love to try the Maggi 'So Tender', we've used the 'So Juicy' in the past, but have never given these a go. I would love to try the Dorset Cereals Berry Granola! The Amy's Kitchen Tomato Soup sounds delicious, I would like to try that. quinola express, could always do with being more healthy! The quinoa - like the fact that it has added flavours, and is quick! Maggi sachets, never tried before. The Jules Destrooper butter crisps sound good to me. The butter crisps sound lush! The Granola as I love cereal and always like to try new flavours. The chunky tomato soup, just the thing for a cold day! The butter crisps, sound lovely! The butter crisp! Sound yummy! The butter crisps - naught i know but i bet there nice! Amy's Kitchen tomato soup. I love their products. Would love to try the coconut water!!! Not sure if id be a fan but still would like to try!!! The Dorset cereals granola - I love their porridge! Amys Kitchen Chunky Tomato Soup. Maggi So Juicy sounds really tasty so would love to try them. How delicious do the butter crisps sound!